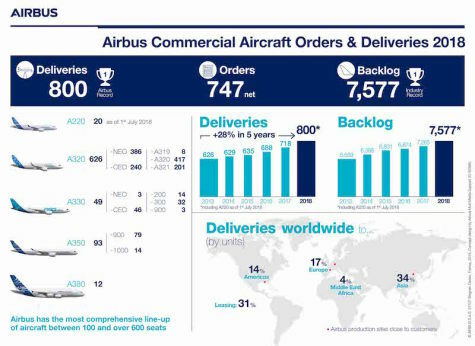 TOULOUSE, France --- Airbus SE delivered 800 commercial aircraft to 93 customers in 2018, meeting its full year delivery guidance and setting a new company record. Deliveries were 11 percent higher than the previous record of 718 units, set in 2017. For the 16th year in a row now, Airbus has increased the number of commercial aircraft deliveries on an annual basis. -- 12 A380s (vs 15 in 2017). For the top-selling A320 Family in particular, the Final Assembly Line (FAL) in Mobile, Alabama, saw its 100th delivery, and is now producing in excess of four units per month. Meanwhile, Airbus’ “FAL Asia” in Tianjin, China, achieved its 400th A320 delivery, while in Germany Airbus commenced operations of its new, fourth production line in Hamburg. Overall, the A320 programme is on track to achieve rate 60 per month for the A320 Family by mid-2019. The Airbus teams successfully reached an important industrial milestone for the A350, achieving the targeted rate of 10 aircraft per month. (EDITOR’S NOTE: In 2018, Airbus booked 831 gross orders, but 84 order cancellations reduced this to 747 net orders. This total includes 135 orders for the A220-300, previously known as the Bombardier CSeries, since Airbus took over the program on July 1. This reduces the year’s net order intake for the other Airbus commercial aircraft to 612, or just over half the total orders booked in 2017.